The Washington tree fruit industry ranks first in the nation for production of apples, pears and sweet cherries. In 2014, estimated production volume was approximately 140 million boxes (42 lb.) of apple, 12 million boxes (44 lb.) of pear and 18 million boxes (20 lb.) of sweet cherries. Approximately one third of production is exported. This website was created to provide a comprehensive, unbiased, research-based information source for the Washington tree fruit industry. Information on this site is primarily focused on the commercial production of apple, pear and sweet cherry. However, there is a limited amount of information on other stone fruits. Besides offering a traditional navigation structure, powerful search capabilities have been added so that site visitors can choose keywords to more quickly find the information they are seeking. A growing library of educational YouTube videos, news stories and research reports will keep visitors abreast of the latest information to both educate them and assist them in making management decisions. We acknowledge with thanks the financial support of the Washington tree fruit industry who are supporting this project through the Tree Fruit Endowment. The WSU Tree Fruit Website was designed to be navigated in three different ways starting from the home page: 1. Using the powerful search tool – accessed from the search box located at the top right hand side of the page; or 2. Using the standard navigation from the links in the left column. Features that are persistent to all pages are items in both the far left and right columns. The far left column has the standard topical navigation structure. The right column contains links to the Decision Aid System (DAS) and AgWeatherNet. Following these links is a mini-Events calendar showing upcoming events. A link to view all events is just below the events list (View All Events). A search box is prominently located at the top right corner of all pages. Typing one or more search terms into the search box and hitting return/enter will take you to a search results page. The total number of results found will appear above a new search box that can be used to refine or change your search, Below this box, the search results will be separated and filtered under five categorical tabs. The default view “WSU” refers to search results coming from WSU domains only. To discover where the results are being drawn from, click on or roll your curser over the ‘i’ icon on the tab headings to reveal a tool tip listing what sites are being canvassed by the Google search engine. Additional sites may be added to the canvassing lists. Initially, the first ten items will be listed to make the page more manageable. However, depending on the the search term(s), there may be many more results. To view the next 10 results, click on the ‘Show More Results’ button at the bottom of the list. The results listed under ‘WSU’ include any item (webpage, PDF, etc.) that is housed on a WSU server, including, but not limited to content on this Tree Fruit website. Because many of the items located in this search category are found off this website, we have no control over the durability of the links and have no editing capability of the content. Items found in this list can be sorted by relevance to the search term(s) (default) or by date (newest first). The content can also be limited to either PDFs or Word documents. This is especially useful if you know that the item you are looking for is a downloadable document of these types and you’d like to limit the results. The next tab category is “Other Universities”. Other top U.S. Land-Grant Universities with significant tree fruit resources are being searched to render the results found when you click this tab heading. Currently, the results list is sorted by relevance to the search term(s) and shows only the first ten items until the “Show More Results” button is clicked. Next tab in line is for “Trade Articles”. Results in this category include links to articles from publications such as the Good Fruit Grower, American/Western Fruit Grower and Fruit Grower News. The results under this category are listed by relevance to your term(s). The next tab category in line is for “WTFRC Reports” which are final research reports for projects funded by the Washington Tree Fruit Research Commission. Results listed under this category include any reports specific to your search term(s) in order of relevance. The final search category tab is for “Technical Articles”. Results found here are articles coming from scientific research journals related to your search. Currently, the journals we access include HortScience, HortTechnology, Journal of the American Pomology Society, and Acta Horticulturae. This list may expand in the future. Some journals may allow viewing the full text of their articles, while others may only provide abbreviated abstracts for non-subscribers. WSU Alumni members may be able to access some of these journals through the EBSCO Academic Search Alumni Edition. For more information about this visit their website here. The Tree Fruit website can also be navigated like any normal website using the standard topical navigation links found in the left hand column. If using a mobile device, the navigation is revealed by touching the navigation icon (three stacked bars) at the top left of the screen. The website is organized into eight main sections. Beginning each section is an Overview page that explains briefly what type of information is included in the related pages. The first section, ‘About’ includes the current page plus a directory of personnel with Tree Fruit research or extension responsibilities, an archive of all of our YouTube videos, an archive of News Items, An archive of our newsletter “Fruit Matters”, Contact Us, and a Frequently Asked Questions (FAQs) page (still to come). The next section is ‘Varieties & Breeding’, which includes information about the WSU breeding programs, a gallery of varieties with basic descriptive information, a page on rootstocks, and a page discussing WSU’s Genetics and Genomics programs. 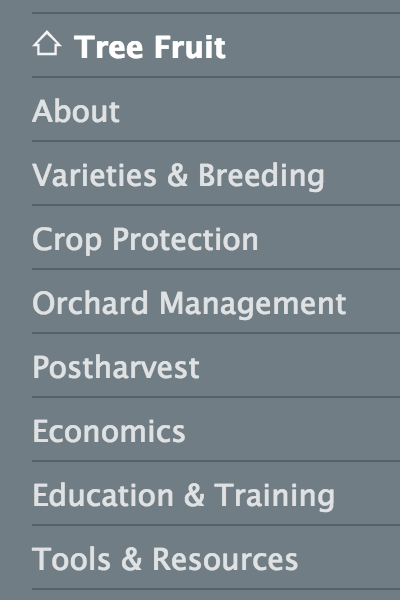 The next section includes ‘Crop Protection’ topics ranging from pest control to managing environmental stress. This section is followed by ‘Orchard Management’ which encompasses a broad range of horticultural practices and concerns starting from establishing an orchard through harvest practices. The next section is ‘Postharvest’ which covers a variety of topics from food safety to export issues and storage practices. And no website on tree fruit would be complete without including a section for ‘Economics’. The final sections of the website include a variety of resources. ‘Education & Training’ includes a mix of videos and listings for live or online educational opportunities. ‘Tools & Resources’, as the name implies, provides useful links to a variety of online tools and resources. When the website is viewed in the standard navigation mode, you will see small fruit icons just to the right of the page title (or below title on mobile devices). If the page contains crop-specific content or resources, the appropriate fruit icon will appear red in color, otherwise, it will appear gray in color. Many pages have content that is general in nature and applies to all crops. In that case, all fruit icons will be gray. Clicking on a red fruit icon will take you to that portion of the page and open the content container for viewing. Please note that this is different from how these icons work on the crop landing pages. Clicking on one of those icons switches you between associated crop landing pages.